Posted on June 26, 2017 by Elizabeth E.
Welcome to Day 4 of the Patriotic Palette Blog Hop, hosted by Paintbrush Studios and Painter’s Palette Solids! A couple of weeks ago, the fine people who make Painter’s Palette Solids sent me some fabric and asked if I would make something. At the end of this post, there is a giveaway so you can win your own stack of red, white and blue fabrics. 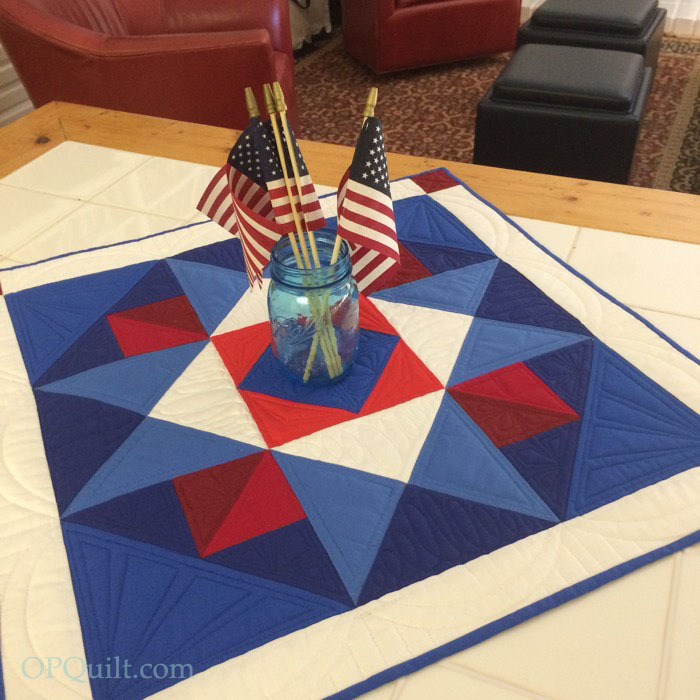 The project I chose was a quick and easy mini-quilt, which finishes at 25″ square, and is perfect for a table top when you want to give a little patriotic flare to the kitchen. I’ve written up a free pattern, available in my Craftsy shop for download (see button to the right), but the instructions are here if you need any tips and help with construction. I was sent fat quarters in three shades of red, three shades of blue and a fat quarter of white. The white needs special cutting: cut the long borders first (see chart on pattern), then the squares for the half-square triangles. You may have enough the other way, but do it this way to be safe. I also was tight on the medium blue, as I used it for the binding, too. You’ll need to provide your own backing (about 3/4 yard, or pieced scraps). I basically constructed this as a nine-patch, a favorite thing of mine to do with minis. 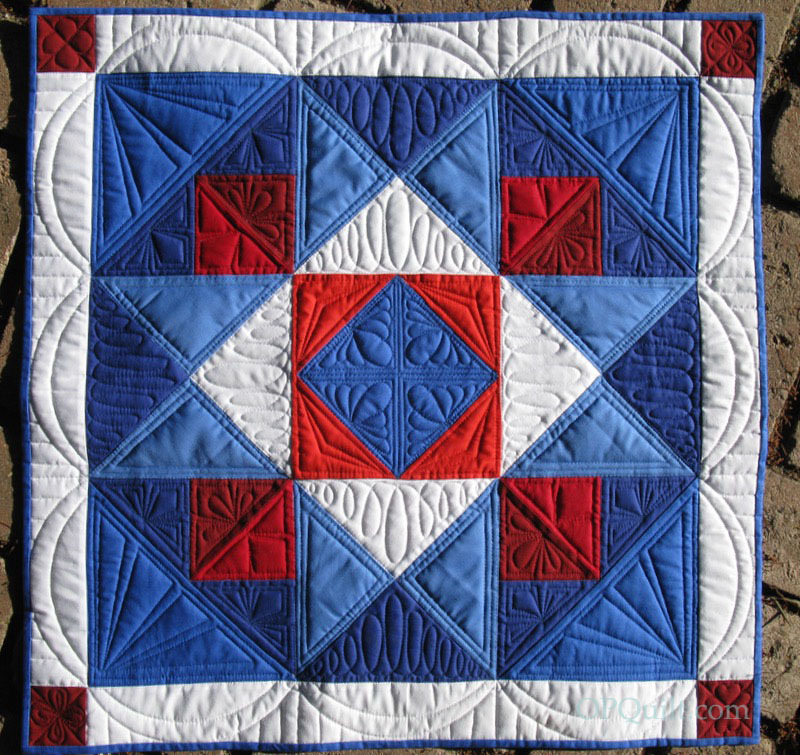 I started by sewing four bright red triangles on the edges of the blue square, then pressed them all away from the center. I squared this unit to 7 1/2″. (This quilt is forgiving if yours is slightly smaller.) I squared all my nine units to the same 7 1/2″ as then I wouldn’t have to square up (or true up, depending on how you refer to it) the finished quilt top. Next was the construction on this corner, sewing the medium and dark red triangles together to make a square, then sewing on the dark blue triangles to make a larger triangle. 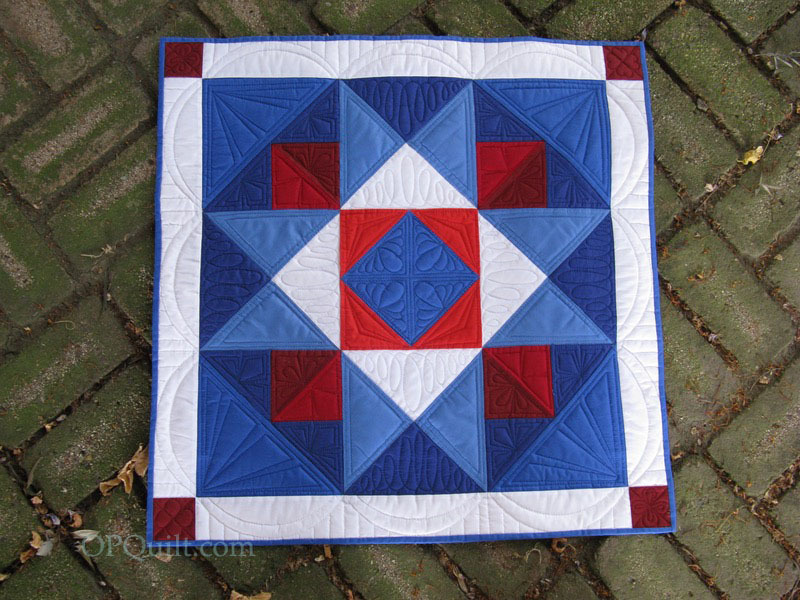 Sew on the medium blue triangle to make it a square; true it up to 7-1/2″ inches. Now make the rest of the blocks: sew the triangles together as shown, then seam those together to make a square. I always press to the side, if you are wondering. Only rarely do I press open, so avoid that. 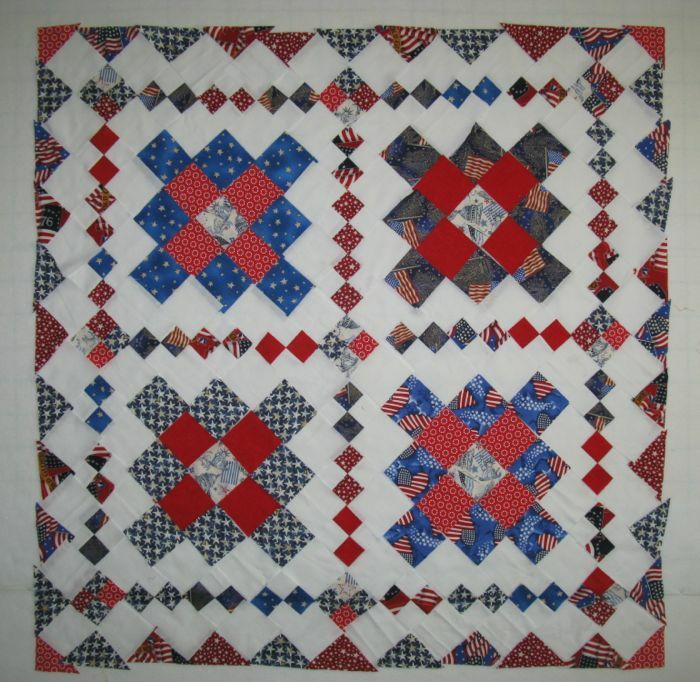 Lay out all your squares (as shown above, left), then sew them together like a nine-patch (upper right). Measure the square; the sides should measure 21-1/2″. Trim your long white border rectangles to measure. 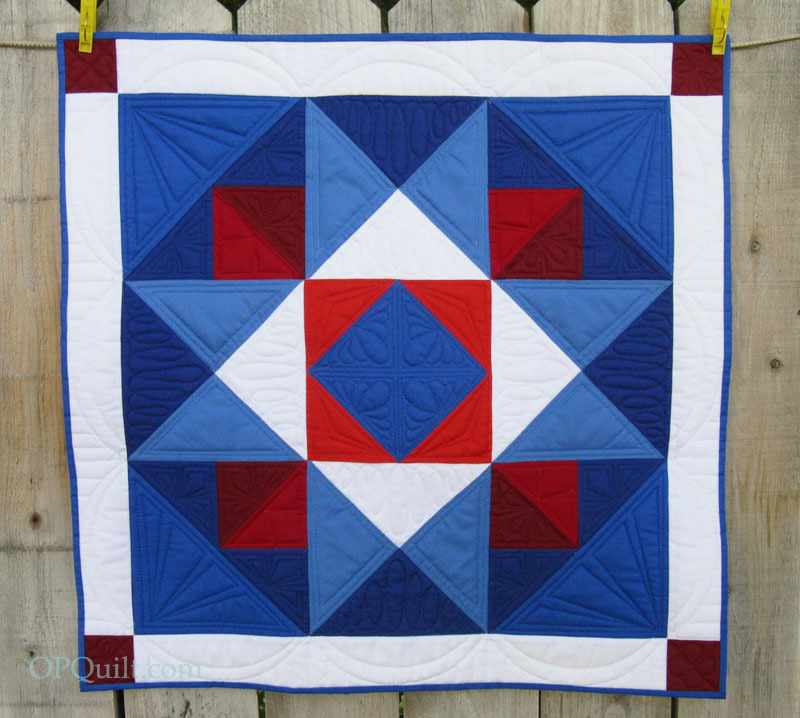 Sew the darkest red blocks on each of two of the white rectangle borders. Sew two white borders: one on top of the quilt and one of the bottom. Press. Then sew on the borders with the squares attached; press. Admire your quilt top. Here’s a picture of the quilt in the sunshine, showing my quilting stitches. I always have the hardest time coming up with what to quilt where; yours may vary. The “bandstand swag” arcs on the outside were a happy accident. This was all done on my Sweet Sixteen machine, but that functions like a domestic sewing machine. I did do ruler work (which is probably easier on my machine than a domestic) but it can be done on your regular sewing machine. Just make sure you have a thick enough hopping foot and thick rulers designed for this task (not your cutting rulers! ); put grippy stuff on the bottom of your rulers, as you’ll use them to help you move the fabric under your needle. If you haven’t heard me tell you about Painter’s Palette Solids, made by Paintbrush Studio, you must be a new reader. It is my FAVORITE solid: it’s easy to work with, has a nice hand, deals well when I need to unpick and re-stitch (I had to do that with the quilting, but you can’t see it, right?). It’s a fairly new fabric to the market, but many brick-and-mortar shops, as well as online shops, are starting to carry it. As is my custom when sewing for Painter’s Palette, I give away my scraps when I finish a project, so that some fortunate quilter can give this fabric a try. BUT! Paintbrush Studios has generously offered up a stack of the fabrics I used in this quilt — seven fat quarters — so you can make your own (giveaway is for domestic/US only). To enter, leave me a comment telling me if you like fireworks, and why (or your most memorable). I’m not talking the little things that are lit up down on street level, but those glorious bursting displays of color and light. It will get us all in the mood for Independence Day. I’ll activate the Husband Random Number Generator and pick a winner, to be contacted by email. Winner has been notified and will be announced in next post. Thank you all! 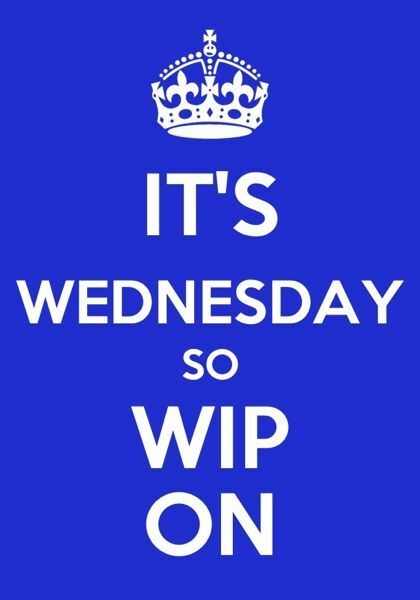 Posted on October 15, 2013 by Elizabeth E.
It’s Wednesday and it’s been a long time since I’ve linked up with the fabulous Lee at Freshly Pieced Fabrics and I mean to remedy that today. I’ve got all the Schnibbles bits up on the pin wall and I need to get them all sewn up and quilted and DONE, because my bee-mates are sending me my green and snow blocks for my Santa’s Village quilt, and I want to see them all arrayed. Funny how one project pushes another to completion. It’s like how tiny the toddler is at the tail end of the family until you bring home the newborn. Then it’s time for that kid to grow up, get potty-trained and pull their weight in the family. Yep, this is kind of like that.